Popeye may have enjoyed his spinach straight from the can, but for today, National Spinach Day, we can come up with 20 better suggestions. 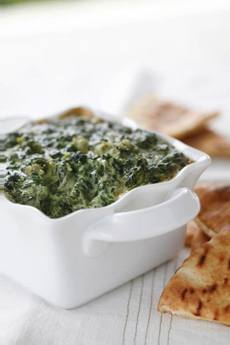 A warm spinach dip, creamy with mascarpone cheese. Photo courtesy Vermont Creamery. 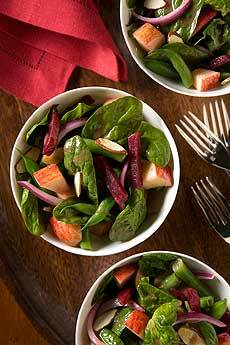 Beet, spinach and apple salad. Photo courtesy Butterball. According to Mediterranean food expert Clifford A. White, spinach comes from a central and southwestern Asian gene center. It may have originated from Spinacia tetranda, which still grows wild in Anatolia. The plant, which does not like heat, was successfully cultivated in the hot and arid Mediterranean climate by Arab agronomists through the use of sophisticated irrigation techniques. The first written reference to spinach in the Mediterranean are in three tenth-century texts. It became popular vegetable in Provence, and by the 15th century was common in Provençal gardens. It traveled north, and Europe became a spinach-loving continent.